My first thought upon seeing this sculpture/planter was "gardens should not be such a burden". Gardens should delight us, teach us, lift us up, and bring joy to our lives. 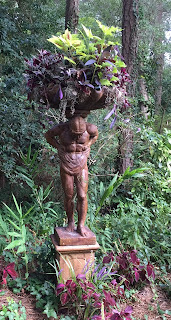 Gardens should not burden us, weigh us down, or sap joy from our lives. Of course, there are times, like the entire growing season, when our gardens require our time and attention for planting, trimming, weeding, and watering. But if all that is a burden? Well, then, perhaps it is time to re-think your garden. You can reduce your garden burden by making the garden smaller, hiring help, or changing out fussy plants for those that need less fussing. You can't do it overnight. But you can do it gradually, eventually. Figure out what is causing the extra weight, what is the most burdensome, and plant by plant, do what you can to reduce the weight, ease the burden, until you have a garden you can once again carry and enjoy. Because gardens should not be a burden. Amen, yes indeed. Some, ever demanding, roses will be shovel pruned this fall. I just love a beautiful rose, but there are far to many other lovely plants that give, without so much taking. Of course, I'll keep a few of the low maintenance ones. It is so easy to keep digging and expanding,and then one day one realizes that one has gone too far. What was once fun is no longer. Thank you for stating this so well! I embrace these beliefs, especially this past year, as I redesigned my gardens to age along with me, more easily. Many plants that have become high maintenance for me are now being loved by friends and neighbors in the particular environment of their gardens. It has been a joy to gift so many plants to so many people, especially since some are beginning gardeners. My gardens are now becoming more manageable to me - and even more beautiful in my view. Sizing down can be exciting and creative. This is the best thought about gardens yet. Gardens should certainly be a joy. I think if you feel your garden is a burden you are doing something wrong. Don't be afraid of change. Change it up so you can enjoy it. Thank you for stating this so well. I am at the point where the gardens have become a burden and depressing, due to weather conditions, diseases, bugs, my aging body, and the relentless destruction by an ever-growing herd of deer. It's hard to let go of plants I've had for many years or to see them succumb to disease, but when it's no longer enjoyable it's time to move on. And I'll have more time (and money) for my other passion - quilting. I'll just have to enjoy my flowers in fabric. When I was "younger" there were no real burdens in the garden. Tasks all seemed to be fun. Now that I am no longer "younger" a lot of that fun now seems a drudge (particularly pruning and weeding and mulching). I am gradually replacing labor intensive plants with those less so. The problem, of course, is when a new, absolutely gorgeous, gotta-have plant shows up in the garden center. Sigh! Maybe a few aspirin will help the lower back. Very well said, and I most definitely agree. Gardens are an on-going process and, quite naturally, have their ups and downs. But when they weigh us down it is time to reassess. I find such joy out in my gardens..and hope to always have that feeling. Absolutely. Mine has become one I'm afraid so change is at hand. She says! Right now I am overwhelmed but expect to be back to my usual soon. There's always the bulldozer. I've been making this change little by little, just like you said. I want to love my garden, and not feel chained to it.